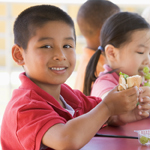 While teachers and administrators are members of your school district they are often under-informed about the scope of the Child Nutrition program. Sharing the rules, regulations and expectations surrounding Child Nutrition can assist in adding value to the program in the eyes of the teachers and administrators. Share with teachers ways that successful Child Nutritiion programs may help them in the classroom. For instance, students who are well nourished will be better able to retain the valuable lessons taught by the teachers. In addition, eating well reduces the likelihood of absenteeism, which generates more ADA funding for administration. Create a message of a common goal - education. Encourage teachers to eat in the cafeteria with their students. Make annual presentations to the school board sharing what was accomplished and future goals. The resources below include speaking points and PowerPoint presentation to help you share relevant information with teachers and administrators. Simple changes in the classroom can make a big impact on preventing childhood obesity. CDC's new resource, Tips for Teachers: Promoting Healthy Eating and Physical Activity in the Classroom, is full of easy ways teachers can promote a healthy classroom.